In response to the growing demand from homeowners, housebuilders and specifiers for coloured PVC-U windows and doors, Eurocell – the UK’s leading manufacturer, distributor and recycler of PVC-U window, door, conservatory and roofline products – now offers fabricators a seven working day turnaround for a wide range of foils. Customers can choose from 31 different colours and finishes for any window or door as a made to order item, secure in the knowledge that they won’t be subject to the traditional three- to four-week wait that usually accompanies made to order profiles. 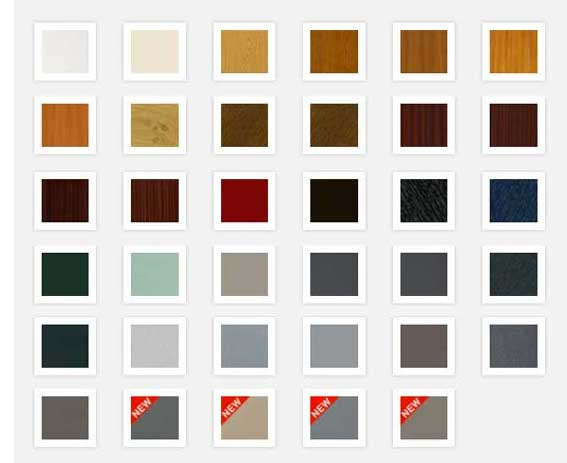 The available palette, the most comprehensive in the industry, allows the homeowner or end-user the choice of regular favourites Rosewood and Golden Oak or, for those of a more contemporary mindset, soothing and stylish greys such as Anthracite, Slate, Kensington and Hazy Grey. Both Anthracite and Hazy Grey can be ordered with a woodgrain or smooth finish option. Even those who are keen to be at the forefront of design and trends can select in vogue colours such as Light Ivory, Anteak and Chartwell Green or two shades of perennially cool black, Ebony and Black Ash. “Whichever of the colours and finishes fabricators order, we now have the capability to complete that order within seven working days. Even allowing for delivery of say one or two days, this is the quickest and most complete made to order service in the industry. Should a customer wish, they can collect their order from us after seven working days”, says Chris Coxon, Head of Marketing. “With the appetite for coloured profile growing across both new build and RMI, the launch of our seven-day made to order service is timely. It ensures that Eurocell fabricators are best positioned to take advantage of this upward trend,” he adds.